GREENVILLE COUNTY (Greer) – We were called to rescue a in Greer, SC where the beloved horse (a 16 year old, almost 17 hand tall Warmblood) of a fourteen year old girl was down. Our team of volunteers got him secured on a glide and into our ambulance (see photo below.) 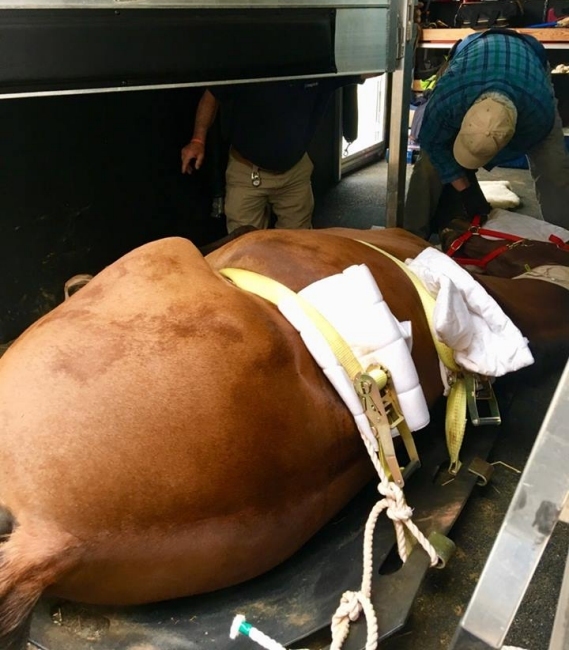 Thanks in part to our timely response, this horse was transported to Tryon Equine for treatment and full recovery. 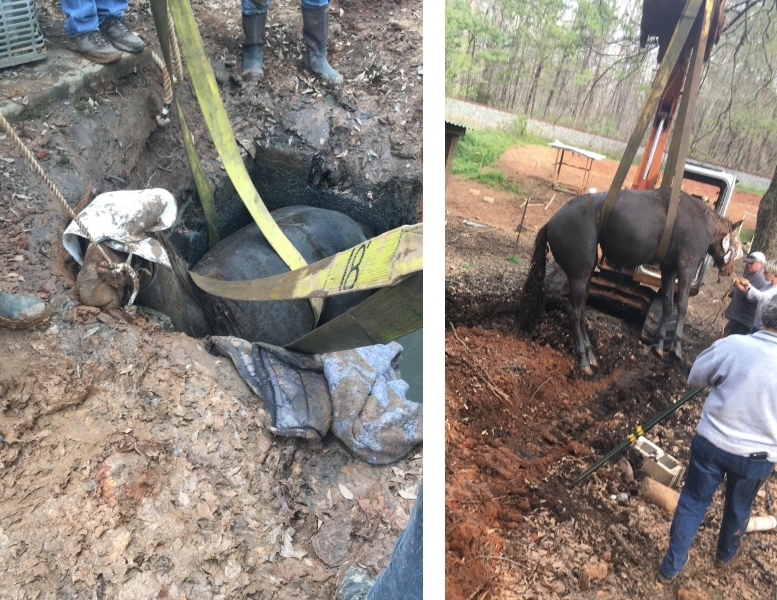 SPARTANBURG COUNTY (Campobello) – We were called to help rescue a mare that had fallen into a septic tank, and were assisted by Inman Community Fire Department, Campobello Fire Department, and Landrum Fire Department along with the indispencible help from Land Creations Landscaping. The tank had to be artfully removed by hand to a level where we could strap this horse underneath. One of the firefighters brought over his own backhoe and then lifted her out of this horrible mess. She is very sore and scraped up as you can imagine, but is alive and doing considerable well after a lengthy wash and treatment. RUTHERFORD COUNTY – The ambulance was called to a farm requesting help for a prize bull who was unable to climb up a river bank after an all night rain storm. 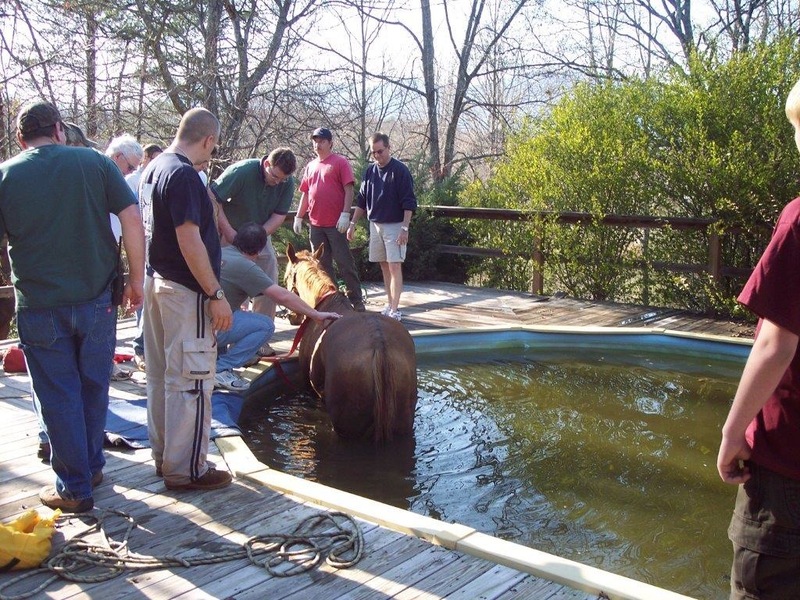 After several hours of painstaking work, the bull was finally pulled from the water. Although the bull was suffering from hypothermia it was determined he would survive. RUTHERFORD COUNTY‚ (Forest City) – The ambulance called to a farm once again to help remove a cow from a mud entrapment. Having been trapped overnight, she was extremely hypothermic. With the help of our technicians and a bucket loader and ropes, we were able to extricate her successfully. SPARTANBURG COUNTY – A call from the New Prospect Fire Department initiated a partnership rescue involving both New Prospect, and Green Creek Fire Departments, assisted by PEER large animal emergency technicians in the extrication of a donkey from a mud entrapment. This led to a successful outcome for the donkey as well as its owner. POLK COUNTY – A Sunday call to PEER on a cool Fall day brought PEER to the rescue of a horse that had wandered into a swimming pool. 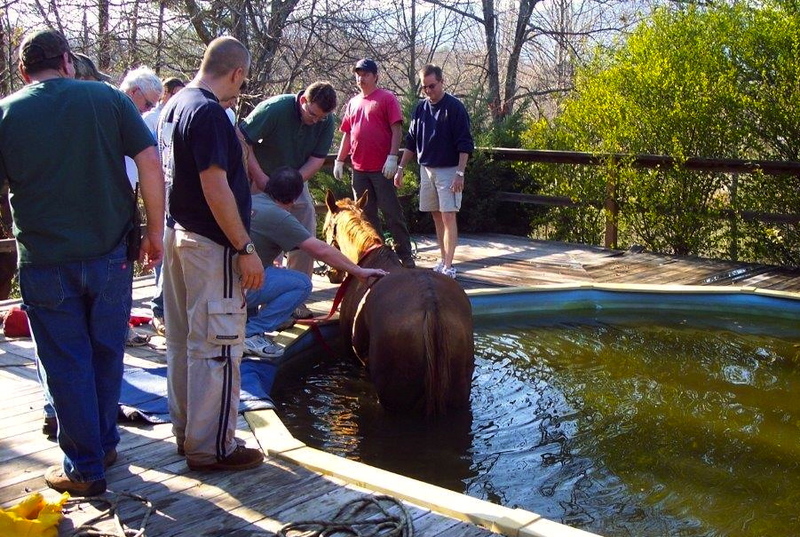 The horse had fallen through the pool cover, become entangled and could not escape. There were no steps and the horse was becoming hypothermic. The immediate response by PEER and EMERGENCY SERVICES again led to a successful outcome for the frightened horse and owner. See below. POLK COUNTY – An owner, desperate for help called when their horse became trapped in a pond. Large Animal Emergency Technicians were able to remove the horse safely without injury. Mission accomplished! SPARTANBURG COUNTY – After spending the night cast in her stall, an aged mare was unable to stand when her owners found her the next morning. With the help of the veterinarian, and PEER volunteers, she was given the opportunity to recover from her injuries and is living out her life with her loving and compassionate owners. 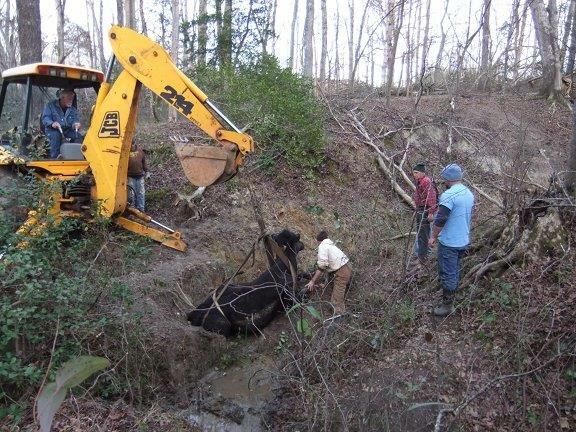 SPARTANBURG COUNTY – Unable to find his way out of a stream bank and trapped in a maze of thickets, the gelding was hidden from view. After several hours searching, he was finally discovered. PEER volunteers, the veterinarian as well as a Spartanburg Fire Company, were able to transport him on the glide to the ambulance. POLK COUNTY – PEER Large Animal Emergency Technicians orchestrated an important rescue and recovery on Interstate 26W. when a large tractor trailer, containing cattle, overturned going up the Saluda grade. With help of the Highway Patrol, Fire Department, veterinarians, and volunteers with additional stock trailers, PEER volunteers were able to transfer cattle from the overturned tractor trailer to waiting trailers without injury to any humans and most of the cattle. POLK COUNTY – The PEER ambulance attends the Annual Blockhouse Steeplechase and while assisting veterinarians, provides aid to injured or dehydrated horses. Additionally, volunteers remove horses from the track and may transport to a local clinic if necessary. Because of the immediate response to the 911 calls, PEER has successfully intervened and prevented further serious injury to horses and their riders in the Hunt Field, at hunter paces, and on public roads.